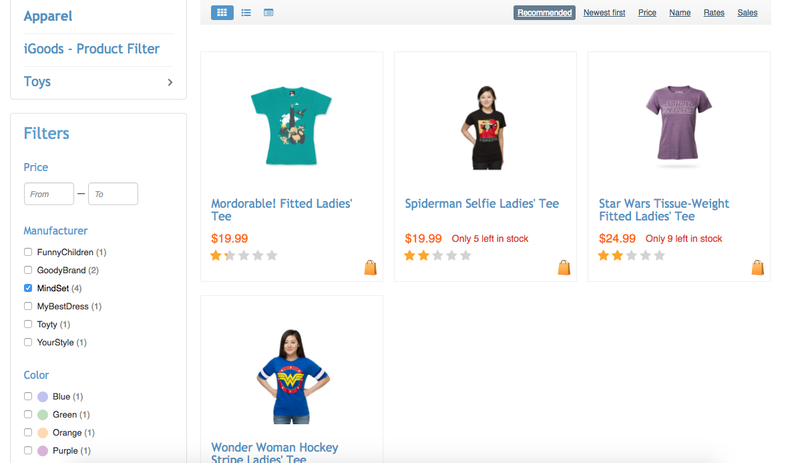 CloudFilters is a powerful faceted search component for your web store. It provides an efficient way to navigate through a large list of products to find items matching certain filtering criteria. Customers can express their search needs in a convenient and natural way — filter by price, category, brand, size, color or any other attribute they want. 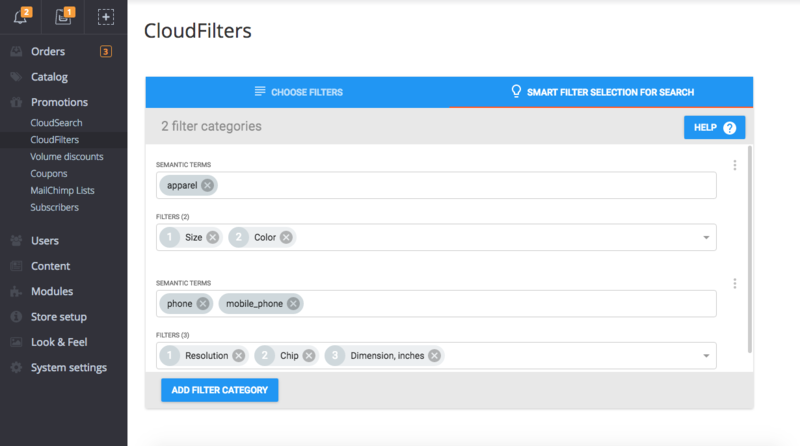 CloudFilters is built on top of CloudSearch — it extends the proven effectiveness and power of the app to make finding the right product a breeze even when there are many search results. It works on search results, category pages and other product list pages. It’s quite speedy and it does not put an extra load of complex database filter queries on your server. We perform filter computations on our service’s side, and the results are fed back straight to your customer’s browser. Therefore, a filter refinement is nearly instant, and it provides a great user experience. 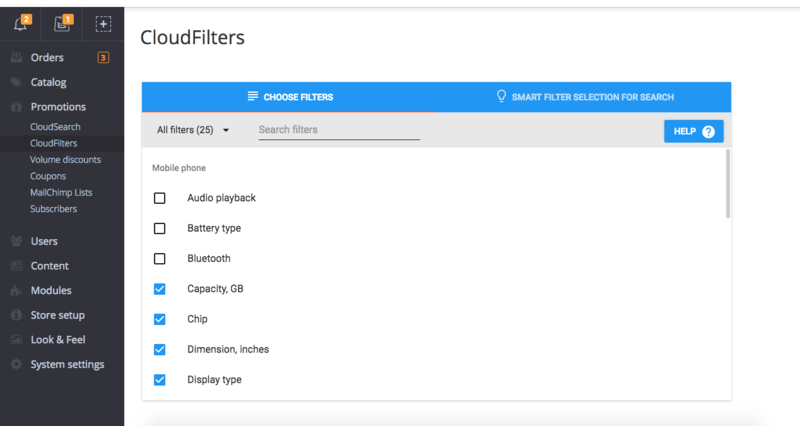 Filters will be dynamically adjusted to your customers' needs, automatically updating the count values to reflect the correct number of terms for the current search. It’s so natural to start a search for some generic term in a large store and then gradually refine the list of results using filters. It started with large retailers like Amazon and Ebay and since then became mainstream. Both CloudSearch and CloudFilters let you meet users’ expectations about what a modern online store should be like. When the number of search results is quite significant, there might be an overwhelming number of filters, too. With the help of semantic analysis, we can automatically identify which filter category best fits the current search. Moreover, filter category setup process is rather flexible and can be fine-tuned to match any product catalog. Faceting and filtering are performed with a per-variant precision. For example, one can filter by price, color and size to find a particular variety of clothing. Once the filter is applied, all the images and prices are instantly updated. Selected filters are saved in the URL so that one can easily share a link to the filtered list of products. It is not only handy but also advantageous from an SEO standpoint. Why is it better than any other filtering addon? We made a thorough competitive analysis and compared this module with the already existing market solutions — our standard Product Filter, X-Cart CloudSearch and similar filtering tools of other eCommerce platforms, like Shopify and BigCommerce. Read the full case study to see the difference. Why service with a recurring fee? The most part of the above features would not be possible without a dedicated software and a capable hardware to power it. We setup and configure the unique environment that handles all your customers’ requests, providing fast & smart faceted search at a low monthly cost. The learning curve for the cloud filters and fine tuning that is kind of steep. Outside of that, like I said, this is one of our favorite modules. It works well.